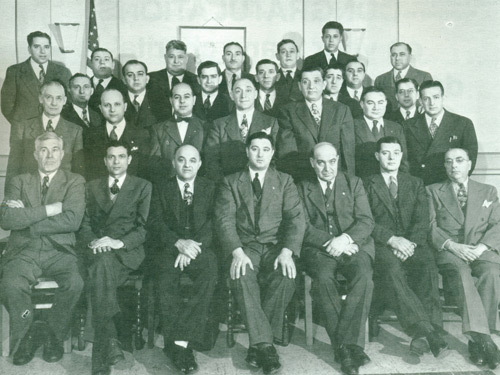 In 1944, 28 men with Italian origins from the town of Southington formed a UNICO chapter in their community. Twenty-two years earlier, the inaugural UNICO chapter had been established in Waterbury with its Italian-American membership providing service to community. From the start, Southington UNICO members embraced three objectives: service to fellow man and community, fostering and promoting Italian heritage, and supporting charitable educational projects. Founding members, such as Ralph DellaVecchia, also adopted the club motto of “Service Above Self” and those values that are inherent in the word UNICO, which is an acronym for Unity, Neighborliness, Integrity, Charity and Opportunity. Nearly three-quarters of a century later, Southington UNICO has fostered a standard of excellence within the community via such longstanding traditions as the prestigious Gold Medal Award, the Unified Sports and Theater Program at Southington High School, and annual distributions of $30,000 to local and national charitable organizations and initiatives. The true spirit of the club is well represented in the longevity and family ties of many of Southington UNICO’s nearly 100 members. Many have been involved for decades and have joined along with family members. “I joined in 1972 because I wanted to be involved in a local civic organization and I had many friends and family already participating in UNICO,” explained DellaVecchia of his longstanding commitment, which included a stint as club president in 1975. By his side for nearly 30 of those years has been Mark Sciota, who calls his fellow Unicans “the finest citizens of Southington.” Mike Fasulo joined the organization in 1991 and served as club president in 2005. Through fundraising, Southington UNICO is able to give back to its community. In 1968, the town of Southington hosted its first Apple Harvest Festival and Southington UNICO proudly set its tent up to be a part of the festivities. It was all hands on deck for the preparing of the meatball and sausage and pepper grinders that would be sold at the festival. Also in the late 1960s, Southington UNICO established the inaugural John L. “Jiggs” DiCaprio Memorial Golf Tournament. UNICO was one of the first civic organizations in town to initiate an annual golf tournament to support charitable causes, and the tourney continues to be an annual undertaking for the club. Other initiatives include hosting the Southington Italian-American Festival, which UNICO has been a lead supporter and organizer of since its inception in 2005. Each year the club also honors the top 25 students in each graduating class at Southington High School and funds the entire SHS Unified Sports and Theater programs. UNICO got involved with the program in 2010 as a sponsor but now funds 100 percent of the associated costs, which include uniforms, bus transportation, and a banquet for the athletes. “One of our major goals is to help people with intellectual and physical disabilities and since day one I have been very moved by these kids. It’s overwhelming to see their faces as they score a goal in soccer, make a basket during a basketball game, or run a race during a track event,” said 2017 club President Ron Ingriselli who has been a club member since 1990. Another undertaking on the club’s plate is the Goat Island project. Southington UNICO is facilitating the reconstruction of the communal ovens on the property adjacent to the Quinnipiac River. Once known as the “Ellis Island for Italians,” the East Summer Street property will help educate residents about some of the town’s first Italian immigrants. The 6.5-acre parcel was sold to the town in 2007 by the Angelillo family (Joe Angelillo, although now deceased, was a past president of UNICO) and a portion of the property is leased to UNICO for $1 a year in order to recreate the special oven house – or communal oven – that was once the center of daily life for families in the neighborhood. The brick structure endured until the winter of 2010-2011 when the structure collapsed. UNICO members are currently working to resurrect the oven as both a cultural and educational offering for residents. “The Goat Island project fulfills two of our club’s objectives because it fosters and promotes Italian heritage and it will be used for educational purposes. Our Italian classes and other groups will take field trips to the site to see how people used to live during the 1800s,” said DellaVecchia. Past President Dave Zoni noted that annual contributions to Southington Community Services, Bread for Life, the Southington YMCA Campership program, scholarships and donations to victims of Cooley’s anemia, a disease that affects children of Mediterranean descent, all lend to the overarching UNICO mission to promote goodwill through civic and charitable endeavors.